I had dinner with one of my favorite people last night. She just moved in to a new place, and Howie and I dropped by for some pizza and good (grown-up) conversation. It was a nice, quiet evening even with a slightly fussy teething toddler. At some point, the conversation turned to financial planning. My friend is very disciplined in general, but she was telling me that work with her new financial advisor had prompted her to start making more frugal daily choices: brewing her own coffee, bringing a lunch, so on and so forth. That's awesome. When I started thinking about, in the aggregate, what I spend on such thing, it kind of shocked me. Especially because even for people like me--very much not the sack lunch type--there ways I could be stemming the outflow of funds as well. Take oatmeal. 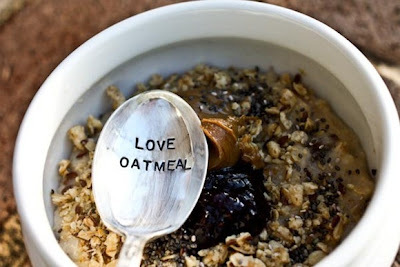 I love oatmeal, and it's my go-to breakfast during the week. Not at home, mind you. Howie and I have such early days (and he likes breakfast at school, as per previous post) that the ten minutes it would take to make and eat it usually don't materialize until well after I arrive at the office. My usual stop for oatmeal is an organic restaurant in my building where it costs me $4.62 for a bowl of oatmeal. Today, out of sheer curiosity, I stopped at one of the other three places in/near my building where oatmeal is available. It cost me $1.61. $1.61!!! The only difference? At the cheap place the only add-in option is raisins, whereas at the other you can add a whole host of ingredients to your oatmeal. Usually I get mine with almonds. Well, I did my homework. I can buy a bag of sliced almonds at the store for under $2, but let's say $2 just for the sake of argument. That means I can buy almonds, buy the cheap oatmeal to put them in, and still be ahead $13 per week, over $650 per year even accounting for holiday weeks. So guess who's switching to frugal oatmeal? I wonder how many other frugal foods are out there waiting to save me money...?